India captain Virat Kohli has agreed a deal to play for Surrey in June. The 29-year-old batsman will feature in three County Championship matches and at least three One-Day Cup games. Kohli, who averages more than 50 in all formats for his country, will lead India in a five-match Test series in England starting on 1 August. "It's long been an ambition of mine to play county cricket and I'm thankful to Alec Stewart and Surrey for allowing me the opportunity," he said. Kohli will miss India's inaugural Test match with Afghanistan in June while playing county cricket. The last time he toured England with India in 2014 at the age of 25, he averaged just 13.40 in five Tests with a top score of 39. Since then he has risen to second in the Test batting rankings and first in ODIs. 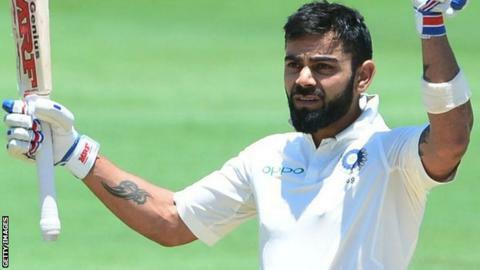 Kohli is available to make his Surrey debut against Kent at Beckenham in the One-Day Cup on 1 June, before rounding off his stint in a four-day fixture at Scarborough against Yorkshire. If Surrey qualify from the group stage of the One-Day Cup, Kohli could play in the quarter-finals and potentially semi-finals in mid-June. The final of the competition is on 30 June, although Surrey have only confirmed he will play up to the Championship match against the Tykes. "We're thrilled to have signed the biggest name in world cricket for the month of June," said Surrey director of cricket Stewart. "Playing and training alongside Virat will be a massive benefit for our players, who will have the opportunity to learn so much from him." India's Test series against England starts at Edgbaston, with two T20 internationals and three ODIs before that in July. Four players eligible to be part of the tourists' Test squad will have had stints in county cricket by July. Top-order batsman Cheteshwar Pujara is currently playing for Yorkshire, while pace bowlers Ishant Sharma and Varun Aaron are in action for Sussex and Leicestershire respectively.